Don’t you just love cell phones? I mean, no matter where you go or who you are around, the cell phone is close. You go in a store and the person behind you asks a question so you turn around to answer only to find out they were talking on their phone. On the way home from the hospital the other day I went by at least 7 different vehicles and each person was driving and talking on their cell phone. I know sometimes I have trouble getting away from mine. Last week I had been to the house for lunch. I needed to make a call and reached for my phone. It wasn’t there! Then I remembered I had left it in my office on my desk. Cell phones have made those who spend time alone, feel more connected. It has made doing business much easier. They also help when you are picking some things up for your wife but not sure exactly what to get. They have become essential parts of our lives. We depend on them in many ways. We use them to stay in touch with other people whether for business or pleasure. Sometimes road noise or the wind can make it difficult to hear when you’re talking on a cell phone. I was checking on a woman in the hospital as I came home from Amarillo on Friday. The woman I was talking to said I was breaking up. There are places where the reception is so bad the call breaks up and we keep saying – ‘Can you hear me now?’ Even then, cell phones remain a big part of our lives. But one of the questions I asked myself is – I wonder how many people talk with God even a fraction of the time they spend on their cell phone? Don’t get me wrong, I’m not trying to judge in any way. It’s just a question that comes to my mind as I consider the number of people on cell phones and the time they spend on them. Think about it. Time after time in Scripture we find those seeking God in prayer. David would lift his voice in prayer. Daniel prayed three times every day. Jeremiah prayed in the midst of his struggles. Zechariah and Elizabeth prayed for a child. Peter prayed and so did Paul. Prayer is a big part of Scripture from beginning to the end. Yes, even Jesus prayed. He prayed early in the morning and far into the night. He prayed for those that came before Him with a need. He prayed when confronted with the struggles of the cross. Jesus spent time talking with the Father. As I considered the times of prayer chronicled in Scripture, I was amazed at the amount of time spent in prayer. 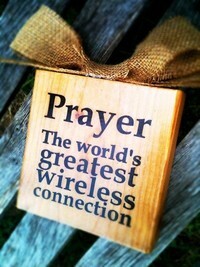 And just think - prayer cannot be interrupted by the wind, lack of a tower or a low battery. We have the promise of God that our prayer to Him will reach the desired place. God hears the prayer of a lost person crying out for forgiveness and salvation. He hears the prayer of a Christian as they cry out in petition, intercession, praise and thanksgiving. As we lift our voice in prayer we know that God will hear and answer our prayers in accordance with His will and purpose. Paul called the Romans to be “…devoted to prayer.” (Rom. 12:12) James said that we are to pray in our suffering and for one another (James 5:13,16). Prayer is vitally important to our walk as Christians. So I’ll ask again – I wonder how many of us spend even a fraction of the time in prayer that we spend on our cell phones? Several times through Scripture we find that God heard the voice of His people crying out to Him. No static and no towers – just God hearing and responding to the cries of people as they call out to Him. There are lots of daytime, night time or weekend minutes that we have for prayer. In fact, you can run over in any of those areas and it’s free. So think about that the next time you reach for your cell phone, make your call, but don’t forget to call on God. And yes, He can hear you!